HEY THERE DADDY O’s,…. 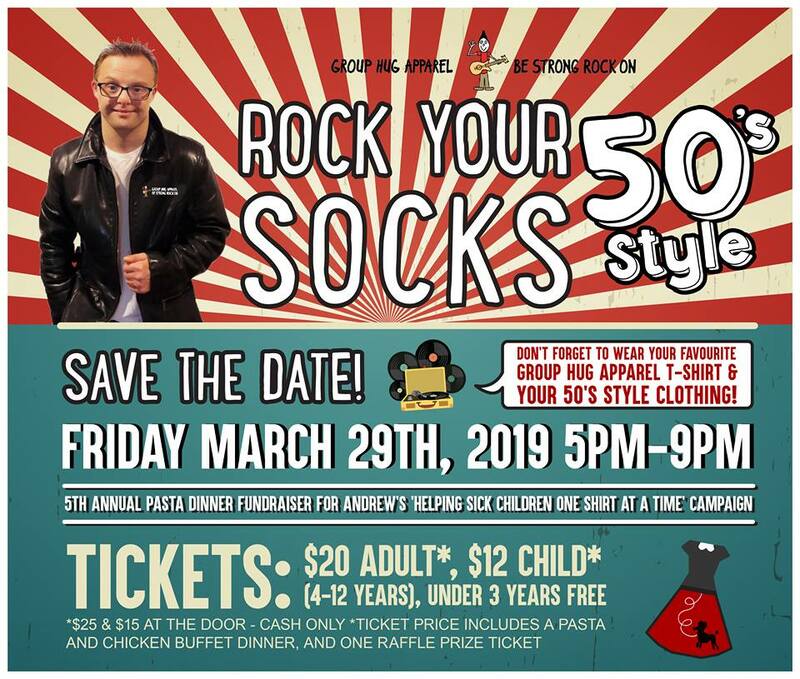 So, ‘Word from this cool cat’ is that he wants you to SAVE THE DATE and come “Rock Your Socks – 50’s Style” with Andrew Banar at his 5th Annual Group Hug Apparel Pasta Dinner Fundraiser to benefit his “Helping Sick Children One Shirt At A Time” Campaign. LOTS OF FAMILY FUN! You loved our photo booth last year so it will be returning (’50’s Style’) again, along with our awesome raffle prizes and a children’s area. OFFERING AGAIN THIS YEAR…want to support Andrew’s fundraiser but can’t make it? We are including our ’pay-it-forward’ option to our tickets again this year. You can buy a ticket and have us pass it on to a local non-profit group! It’s a win-win! SO PLEASE MARK YOUR CALENDAR! So you can ‘Burn Rubber’ on over to our ‘Pad’ (for the night) at Colasanti’s Tropical Gardens on Friday, March 29th from 5pm to 9pm. TICKETS CAN BE PURCHASED IN ADVANCE, ONLINE HERE: http://shop.grouphugapparel.com/…/rock-your-socks-fundraiser ‘Hard copy tickets’ available soon for anyone not purchasing them online. This entry was posted in Helping Sick Kids One Shirt At A Time. Bookmark the permalink.